Visitors from around the world have been intrigued by the Shaker religious and social experiment for more than 200 years. Each of the 8 sites listed here will introduce you to a different element of the nationally (and internationally!) significant Shaker story. The Sabbathday Lake Shaker Village has been an active community of Shakers since 1783. Shaker Sunday meeting is open to the public-all are invited to the traditional service that begins at 10 AM. The Shakers open their village to the public from Memorial Day to Columbus Day, Mondays through Saturdays (closed Sundays), 10 AM to 4:30 PM. The Shaker Library, the village’s research center, is open by appointment year round. Tours. Special exhibits. Shaker Museum Reception Center. Shaker Store. Sabbathday Lake Shaker Retreat Center. Crafts workshops and demonstrations (demos are free). Shape Note Singing (free). Maine Festival of American Music. Open Farm Day (free). Maine Native American Summer Market and Demonstration (free). Apple Saturdays (free). Nature Hikes. Shaker Christmas Fair. Click HERE to visit the website of the active Shaker community in Sabbathday Lake, Maine. Nestled in a valley between Mt. Assurance and Mascoma Lake, in Enfield, New Hampshire, the Enfield Shaker site has been cherished for over 200 years. At its peak in the mid 19th century, the community was home to three “Families” of Shakers. The Great Stone Dwelling at Enfield is one of the Shakers’ greatest physical achievements. The six-story stone structure was the tallest domestic building north of Boston when it was completed in 1841. Today, it functions as an inn and restaurant, providing the rare experience of sleeping in a Shaker Dwelling House. Canterbury Shaker Village in New Hampshire was founded in the 1780s and was formally “called to order” in 1792 when the Shaker Meeting House was erected. At its peak in the mid-19th century, the community was comprised of three families (Church, Second and North), containing a total of 300 Shakers. Today, twenty five original buildings comprise the museum, which features guided tours, a gift store, and a restaurant. Click HERE to visit the Canterbury Shaker Village website. From 1787 to 1947, the Shakers at Mount Lebanon led the largest and most successful utopian communal society in America. From this central community developed the Shakers’ ideals of equality of labor, gender, and race, as well as communal property, freedom and pacifism. The Shaker Museum and Library was founded in 1950 by John S. Williams, Sr. on the site of his Old Chatham farm. 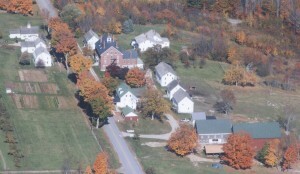 In 2004, the Museum acquired the North Family Mount Lebanon site, consisting of 30 acres and 10 extant Shaker buildings, plus the iconic Mount Lebanon Meetinghouse. Operations were consolidated to the Mount Lebanon site in 2009. Click HERE to visit the Shaker Museum Mount Lebanon website. The first Shaker settlement was founded in Watervliet, NY in 1776 by Mother Ann Lee and seven followers. The site thrived into the 20th century and grey to include four “families”. The spiritual name attributed to the community is “Wisdom’s Valley”. Mother Ann Lee, Mother Lucy Wright, and 442 other Shakers are buried at the site. In 1926, Albany County purchased the Church family site and demolished all but eight buildings. The 1848 Meetinghouse remains on the site and retains much of its original character. Click HERE to visit the Shaker Heritage Society website. Near Cleveland, Ohio, the North Union Shaker Village was established in 1822, when Ralph Russell, a pioneer settler from Connecticut, persuaded his family and neighbors to convert to the Shaker religion. The group donated more than 1000 acres of land to establish the village. The community disbanded in 1889. The 1910 house museum, built on land that was once the North Union apple orchard, contains a collection of furniture and artifacts from North Union and other Shaker communities. Click HERE to visit the Shaker Historical Museum’s website. After the Shakers’ arrival in Kentucky in 1805, one of the earliest converts contributed a large farm on Shawnee River Creek, which eventually became the site of one of the largest Shaker communities. The site accommodated approximately 600 shakers in 250 structures by the mid-1800s. The Civil War and the Industrial Revolution took a heavy toll on the community, which closed in 1910. Pleasant Hill currently holds over 2,800 acres of land and a magnificent collection of Kentucky Shaker furniture. Although Western Shaker building and furniture styles conform to Shaker principles, they represent distinctive interpretations based on regional design traditions and available materials. Click HERE to visit the Shaker Village of Pleasant Hill website. The South Union Shaker Village, comprised of 225 buildings and 6,000 acres, was the longest-lived community in the West, active from 1807 to 1922. The Southern design influence on the Shakers of South Union gave it a unique image, distinctly different from the Eastern Shaker villages. The museum currently owns and manages seven original Shaker buildings on 500 acres of original Shaker farmland, and has the largest collection of Southern Shaker furniture in the United States. Click HERE to visit the Shaker Museum at South Union website.